Please note that space is limited. Register now! You may submit your questions in advance using this link. One of the most talked about topics in the past several years has been whether the Lean & Six Sigma community needed some standardization of Black Belt and other Lean & Six Sigma Belt training curriculum. During several panel discussions held during the most prominent Lean & Six Sigma Conferences, the audience and the panel members concluded that standardization of training was critical for providing consistency. In an effort to respond to the needs of the LSS community, a Committee was formed consisting of a group of well-known experts on Lean & Six Sigma, to create a set of standards for Black Belt Training. After a great deal of work, the LSS Standards for Black Belt Training is complete. Dr. Feldman will discuss the main clauses and components of the standard, and describe the implications of the standard on existing and future certifications. He will answer questions regarding the future of other planned Belt standards. How will the Standard be deployed? What are the key elements of the Standard? How will this Standard help my organization? What other Standards will be developed moving forward? The following topics will be presented with a brief explanation of each, the rationale for including it in a LSS BB curriculum and examples of how these tools will apply to all types of organizations be they manufacturing or non-manufacturing. Faculty: Dr. Ken Feldman, MBA, LSSMBB, BSIE, MSIE., Director, Rapid Continuous Improvement, Dr Pepper Snapple Group, has a dual Ph.D. in Industrial Engineering and Psychology with the distinction of having Dr. W. Edwards Deming, the esteemed quality Guru on his Doctoral Committee. He also holds a Master of Science in Industrial Engineering, a Master of Business Administration, a Bachelor of Science in Industrial Engineering and a Certificate in Occupational Safety and Health. Prior to joining Dr Pepper, Ken was a Principal with Accenture Consulting. Previously, he was a Senior Vice President in the Quality and Productivity Group at Bank of America, District Director of Performance Improvement at the North Broward Hospital District, and worked at GE Capital providing global LSS training and coaching. Ken has taught in higher education including undergraduate, graduate, Executive MBA and MBA classes at the University of Miami, Florida Atlantic University and the University of Phoenix.He has more than 40 years of experience helping organizations improve quality and performance. Ken has worked in such diverse industries as healthcare, steel, corrugated containers, printing, higher education, chemicals, food products, paper, U.S. Military, financial services, electronics, automotive, paint, ink and others. Who Should Attend: This webinar will be helpful for participants who are considering developing their own internal LSS BB curriculum and training. Participants who wish to be able to evaluate LSS BB training provided by consultants or other organizations will have a list of topics and content to assess the completeness of their proposed training. Existing LSS BBs will find this session useful to assess their own personal levels of knowledge so they can decide what, if any, future personal training needs might exist. What Makes this Conference a Cut Above the Rest? Hundreds of Master Black Belts, Black Belts, Green Belts, and Yellow Belts will come together in early spring 2017. Internationally recognized speakers will address the crowd at this leading event for process improvement professionals. With multiple keynotes, 50+ breakout sessions, expanded sessions and pre- and post-conference activities, this year's event aims to be the largest, and most comprehensive Lean & Six Sigma event of 2017. The conference attracts international and national experts on topics including innovation, process improvement, and value creation. In its early days, Lean and Six Sigma methodologies stuck to their manufacturing roots but in the last decade, these tools have been played a major role in making processes more efficient, increasing profitability and improving customer experience across a variety of industries. 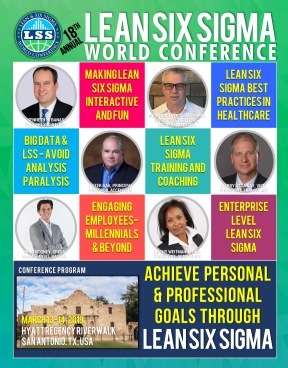 The 2017 Lean & Six Sigma conference encourages representatives from all government, for profit and not for profit organizations to share experiences. For the first time, the Lean and Six Sigma World Conference will be awarded “Deployment of the Year”, “Project of the Year”, and “Innovation of the Year” Awards at the 2016 conference in Orlando, Florida. We want to hear from you in 2017 about why your team should win!